In recent years, social media has become a more and more important part of businesses’ marketing strategies. There’s no doubt that social media marketing works, and that it helps brands achieve incredible results because otherwise, brands wouldn’t use it. What’s more, we have the social media statistics that back it up. Social media was only a few years ago something that most marketers considered a fad and something for the kids, but now, more and more people are starting to realize the incredible potential that lies in social media marketing, and that it’s just not true. It might have been something for the kids when it was new, but it sure isn’t today. When 2.46 billion of the world’s population are using it, we can be sure that social media is here to stay. As a result, I think it’s safe to say that if you aren’t yet using social media, you’re missing out. Big time. Social media was maybe “optional” for brands to use years ago, but it sure isn’t today. If your brand isn’t on social media, does it even exist? You’re probably here because you have realized that you are missing out on some great opportunities for your brand by not being active on social media, and if that’s the case: welcome! The thing is, digging into the world of social media without having much knowledge about it or how you should use it for optimal results can be extremely overwhelming. To help you get off on the right foot, I’ve written this article with 14 Ways To Get Started With Social Media Marketing For Your Business Today. When starting out, it’s essential that you have a clear plan and strategy for how you’re going to work, what you’re going to do, and how you’re going to do it. The same principle goes for all aspects of marketing, really, and not just for social media. Without a clear plan and strategy, you won’t know what you’re working towards, and you’ll have a hard time evaluating if social media is benefiting your brand. Now, we know that social media has tremendous marketing power, but the thing is that unless you’re using it correctly, it won’t do much good for you. Matches are great for lighting a candle, but if you’re using the wrong end of the match when trying to light it, you’ll have a hard time lighting your fire, won’t you’? The most important part of creating a plan for social media is deciding what goals you want to achieve, and what the main reason for why you’re going to use it is. Social media can help you drive sales, increase brand awareness, improve your customer relationships, build new customer relationships, increase the trust in your brand, and a lot more, but you’ll be better off deciding on one or two main objectives for your efforts. Otherwise, you’ll end up running around like crazy, and waste your efforts. Sure, if you’re using social media to build your customer relationships, you are probably also going to increase their trust and loyalty to you, but remember that it is still the customer relationship building that will work as the main objective. The other parts will just be by-products of your efforts. The goals and objectives you set should reflect the efforts you make on social media. When you’ve defined your goals, you need to ask yourself why you’re doing it and what you’re hoping to achieve from it. You might say that you want to improve your customer relationships because you want to make them more loyal to your brand, but then you can’t forget the question of what you’re hoping to achieve from it. Are you hoping to get all of your customers to buy from you again, or are you hoping to make them so loyal that they become brand advocates for your brand? As you can see, it is greatly important that you define the ”why” and be clear with what you mean. When you’ve answered all of those questions, they’ll be able to guide you in the direction of your social media efforts. For example, if your objective is to make your brand more approachable, then only sharing promotional posts obviously isn’t the ultimate way for you to work towards that. There are tons of social media platforms that you can use, and when starting out, it is tempting to jump on all of them. And that’s also a common misconception that I often acknowledge people that are just starting out with social media have. The idea is that the more social media platforms you use, the more people you’ll reach, and ultimately, the better results you’ll generate, however, that’s far from the truth. Choosing social media platforms is difficult, yet still, it is important that you limit yourself to a few and then go with those. Remember that you can always jump into new platforms whenever you want, but when getting started, you’ll be better off starting with a few. The common idea is that the more platforms you use, the better, but using too many platforms only mean that you’ll spread your efforts across them all. The truth is that you’ll be far better off generating amazing results on a few platforms rather than average results on many. Sure, if you have the resources that a large company like Coca-Cola has, you can pull off being active on many different social media platforms at once, but unfortunately, most brands aren’t in that position. Social media takes time, often more time than people might think, and trying to juggle tons of platforms at once with few resources will most likely end up in disaster in the long run. 3. What platforms should I choose? What platforms you should choose depends mostly on your target audience. Different social media platforms have different demographics, and this is something you should pay great attention to when selecting which to work with because this is also what should determine which you choose in the end. If your target audience consists of men, then obviously you shouldn’t be putting your efforts in a platform whose user base consists mainly of women, like Pinterest. I can tell you one thing though, and that is that you should use Facebook. In fact, I highly recommend all brands to use Facebook. 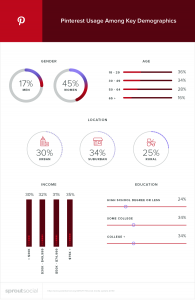 Facebook is the main platform that most customers expect brands to be on, plus, the demographics of the platforms are relatively well spread across the genders and ages, so chances are, you will be able to find your target audience there. Plus, Facebooks had 2.07 billion monthly active users of the third quarter of 2017, so even if there’s only a few percent of people that fall into your category of your target audience, there will most likely be more people than you’ll have the ability to reach. 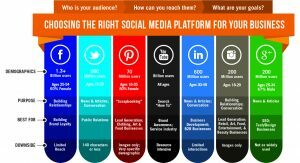 The bottom line is that you need to choose platforms based on your target audience, but also based on your objectives. In your strategy and plan, you defined what objectives you had with social media, and your selection of social platforms should also reflect that. In other words, if your goal was to give your customers better customer service, then obviously you should select platforms that allow you to provide that. For customer service, platforms like Facebook and Twitter are best for that, because they’re mostly text driven. What’s more, if you are terrible at creating videos but great at taking photos, you shouldn’t be opting for a platform like YouTube that is only video-based, but instead a platform like Instagram that is based around photos. A mistake that I see many brands do when starting out on social media is to use different handles for each of their social media accounts. As a brand on social media, you want to make yourself as discoverable as possible, and you want to make it as easy as possible for people to find you, and having a consistent handle on your social media pages is part of that. What’s more, you also want to have a simple username without unnecessary dots, underscores, or numbers. Ideally, you should have your brand name spelled out because that’s more likely what your customers will be searching for. Obviously, if I would be searching for Coca-cola on Facebook, I’d search for just that: Coca-Cola. Nothing else. Lastly, if I follow a brand on Instagram, and then decide to look them up on Facebook, what do you think I would search for? The exact same username as they have on Instagram, of course! Therefore, strive towards having the same username across all your platforms, but if that isn’t possible, try to make as small changes as possible to the username. You want to make it super easy for people to recognize your brand across the different platforms! Your profiles will most often be what people will see first when they encounter your brand on social media, so therefore, you want to make them as appealing as possible, and filling them with complete information is an important part of that. If you’ve ignored writing in some parts about your business and leave them bland, it will send bad signals to its visitors. People might think that you’re taking social media unserious, that you aren’t using it anymore, or that you are an unserious business. Not having filled out your profile with complete information can be the difference between a follow or an abandoned profile and a bad reputation. If you fill out your profile and make it as appealing as possible, you’ll increase the chances that people who come across your page will find it interesting, keep scrolling, and find your business appealing. Apart from including basic information such as email address, contacts, etc., you also want to give your people a reason to follow you and continue looking at your profile. There are billions of accounts on social media, but why should the follow just you? It’s good to have your value proposition clearly stated in your profile, as it can convince people that you have something that they want. Remember that social media is a fast-paced landscape, so you only have a few second at most to convince them, so get right to the point. As mentioned earlier, social media is extremely time-consuming. And if you start working with too many social platforms at once, trying to keep up your presence there, you’ll soon have a hard time finding time to do a great job on them. Before you start with social media, it’s crucial that you understand how time-consuming social media marketing really is. Essentially, being a social media manager means that you have to be a content creator, a customer service manager, a public relationship manager, a social media marketing manager, and many more at once. I think it’s safe to say that time can quickly run away from you when doing all of these things. Therefore, you should ideally have a team which manages different parts of social media. One person can do it all, but it will be more than a full-time job, plus, you’ll be able to generate much greater results and reach your full potential when the tasks are divided between a number of people – instead of letting one person try to juggle it all. Once you get a hold of everything, and get more resources, you can start scaling, but the key is not buying off more than you can chew in the beginning, because what will end up happening is that you’ll get discouraged, and you risk burnout. The key to social media success is having a great team and a great strategy. Being a social media manager means handling many different business roles at once, as mentioned, and that’s a personality that the social media should have, however, having too many areas at once to work with will inevitably mean worse results. Because rather than focusing on one thing and doing the best job possible, being short on time means you have to jump between them, and try to spread your time evenly. By having a team, you can focus on what you’re best at, and put 100% focus on that. When you are in a position where you can do that with your social media strategy, that’s when you have the greatest opportunities to achieve great results. Don’t try to save a few dollars by trying to do everything yourself or trying to cram out every single drop of working power from your social media manager, because doing so will keep you from reaching your full potential on social media. Most brands won’t have a huge social media budget for hiring a bunch of people to manage their social media marketing, but there are tons of places where you can get cheap freelancers like Freelancer.com and Upwork. Just getting someone to take care of one of the aspects of social media can be a huge relief for the social media manager, and it can also mean even greater results for your brand. Don’t see social media as a place for you to distribute free ads and shove them down your followers’ throats. Because that’s not how you generate great results. People aren’t on social media because they need to fill their need of seeing ads. Because really, no consumer has such need. Instead, the key to generating great results on social media is understanding why people are there and what they want. Obviously, as a marketer, you want to cram every bit of marketing juice from social media by promoting as much as possible, but thinking this way about social media will only benefit you short-term. If at all. Because what will end up happening is that people will run away as quickly as possible when they notice that you are sharing a bunch of crap that they don’t want to see, and that you’re only shoving promotion down their throats. To reach the best possible results with social media, you need to provide your audience with value. There are billions of accounts on social media, so if you don’t have anything of value to provide your audience, people won’t hesitate to go somewhere else. However, if you provide them with amazing content that bring them value, they’ll stay glued to your brand on social media. The master of providing value in business and marketing is Gary Vaynerchuk. He is a firm believer that the more value you give your audience, the better results you’ll generate. Because all of your competitors go to their customers and ask ”do you want to buy?”, and very few say yes – because they have no reason to! However, if you provide your customers with so much value that they’ll choke, without asking for anything return, they’ll eventually feel obligated to buy from you, so that’s what they’ll do. And that’s how success on social media works. Of course you want to use social media as a marketing tool, but as you’ve probably guessed by now it’s a bit different from other marketing methods. The more banners you put up, the better results you’ll generate, simple, right? But the more marketing posts you’ll share on social media, the more people you scare away. I know, it’s hard to change your mindset, especially if you’re used to thinking the traditional way about marketing, however, it is essential. Learn to live after the principle of giving more than you take on social media, and you’ll soon notice that you’ll have far greater success than your competitors that aren’t doing anything else than taking. Sure, you can put out some marketing posts every now and then, and some posts where you let your audience know about a special deal, but when it’s time to so so after you’ve given your audience value, they’ll be far more impactful on your audience, because they’ll actually value what you bring to the table. Now, I am talking about bringing value but what does that really mean? Well, most of the time no. The thing is, you need understand what your target audience finds valuable. And what you’ll also notice when you start putting out content that is valuable to your target audience, more people will start coming. Value can be anything, unsurprisingly, that your audience finds valuable. But it can also be in the form of ”money” value such as discount codes or coupons. It’s all about getting to know your target audience, understanding what appeals to them, and then provide it to them. The best part is that the majority of your competitors don’t do this, leaving a huge opportunity for you. I started this article by talking about the importance of having a clear plan, however, a social media strategy is so much more thorough than just defining your objectives and the ”why’s ”. In essence, a social media strategy will tell you almost everything you need to know about your social media efforts, and how you should operate to achieve the best results. In short, it summaries everything you plan to do and hope to achieve by doing it. The more specific you are, the easier it will be to execute on it, and the more specific you are, the easier it will be to evaluate your efforts and quickly identify if you’re actually generating any results from them. The social media strategy will tell you a lot, but it won’t tell you much about content. The content strategy should be a part of your social media strategy, but because the content strategy is such a crucial part of social media, it is often done separately. The simple reason that the content strategy is so important is that great results are achieved on social media when both parts are executed on together because they complement each other, and without one another, you can’t really do your job on social media. Why is the content strategy important? well, your social media presence is made up of your content, and without content, you have nothing to offer your audience. Remember that the content you share is your value proposition to your audience. And we now know how crucial it is to provide your audience value on social media, do we? The content will help you know what content you should share, how you should share, and when you should share it. In other words, your social media content strategy is a guide to how you’ll manage your content on social media. As mentioned in the beginning of this article, value isn’t the same thing to all audiences, and by having a content strategy, you ensure that the content that you are putting out is valuable to just your target audience. And since you have now created a social media strategy that should include information about your target audience and how can best appeal to them, you can make sure that the content you create and share reflects your main objectives. When should you share it? How should you share it? How often should you share it? What’s more, you should also define what type of content you are going to focus on. First off, what should mainly impact your choice of content should be your expertise and resources. For example, if you are experienced in creating videos, then obviously you should focus at that. If you’re an expert at creating graphics, then do that! You don’t want to do anything you’re not good at. But of course, you can always practice and learn how to create other types of content and then include those into your content strategy. The second thing that should affect the type of content you focus on is your objectives and goals. If your main goal of social media is to convey your brand message and show that you’re more than just a logo and fancy brand name, you probably want to opt for video as it opens up completely new opportunities for you to convey feelings and connect with your audience on a deeper lever, than for example text content. It’s easy to get carried away with your content and forget about the whole reason to why you’re sharing your content: your audience. Ask yourself the simple question: if you were a customer of your brand, what would you want to see? Let me guess, you didn’t say ads, did you? Identifying your target audience is crucial for social media success. After all, it is your audience that determines your success. This is not inly important in social media marketing by for all marketing efforts you do. Without having defined your target audience, you’ll end up shooting in the dark, and do you think you’ll hit your target? By identifying your target audience, the people who are most likely to be interested in your business and become customers of yours, you’ll be able to spend your efforts better, save time, save money, and ultimately generate better results. 5 of the people speak english and 5 of the people speak german. Now, if you are educating your students in english, which group do you think will learn french and which group do you think won’t? In other words, just because 50% of the people didn’t meet your ”requirements” for your objective, you generated worse results than you could have done. What if you would have had 10 students who all spoke english fluently? A result that would be twice as good. In theory, that is. The foundation to identifying your target audience is getting to know them better, and as a result getting a better understanding of how you can target them. This is also great for getting a better understanding of what type of content your audience wants to see. What age are my target audience? Where are they spending their time on social media? What gender do they have? What people do they look up to on social media? What does your target audience dislike? The answers to all of these questions should ultimately impact all of your social media efforts – from what content you share to what brand voice you use. Video has an incredible power in marketing, so why not take advantage of it? Now, I’ve talked about how you should choose the type of content you create based on your resourced and expertise, however, if you have the possibility in creating and sharing video, it is greatly effective. It’s important to find the right mix of content on social media. It is also good to know that different type of content works differently across social platforms. Don’t jut share a bunch of promotional content because you want to market your new product, but try to find a mix which your audience likes. Don’t just settle with one type of content but instead dare to mix it up between video, text, photos, and so on. How can you know how well you’re performing if your aren’t measuring results? Measuring results allow you to better understand what works and what doesn’t, so you can tweak your strategy and better use your time and effort. Remember your initial goal of social media, and look at how you’re working towards that goal, If you aren’t regularly measuring, you might eventually realize that your efforts aren’t supporting your goal. Most social media platforms have built-in analytics tools and give you a ton of information about how you are performing. You have probably realized by now that unless you’re using social media, you’re missing out on great opportunities. But getting started isn’t super easy, especially if you have no knowledge of social media or how you use. it. In that case, it can be really overwhelming when first getting started, as a result, getting started in the right end is crucial for coming off on the right foot and not getting discouraged by how difficult it is when really, it doesn’t have to be.